We have previously considered basic notation of a melody. That’s all very well but our melodies need to conform to some scale. A key or scale is a set of notes that sound well together and can be accompanied by chords (more on those later). It is a division of the distance between a given note e.g. E on the first line of the stave and then next highest note of the same name e.g. E in the fourth space on the stave. This is called an octave because it includes eight notes E, F, G, A, B, C, D, E.
There are many ways to divide the distance between these two notes. Some cultures use five divisions, others seven and there are even twelve divisions in what’s called the chromatic scale. But we usually use what’s called a diatonic scale which has seven steps corresponding to doh, re, mi, fah, soh, lah, ti. Usually the upper note is repeated so if we start on A then we would use the letters A, B, C, E, F, G, A’ (high A). These scales can be called major or minor depending on the arrangement of the distances between the notes. A scale has a pattern of distances between the notes. These distances are called intervals (see later). The intervals used in building a scale are called semitones and tones. A semitone is the smallest distance between two notes on a piano, or two frets on a guitar, e.g. E-F on the piano or open 6th string to 1st finger on the 6th string on the guitar. A tone is the distance of two steps, e.g. C-D which involves the notes C-C#-D and it corresponds to the distance between two white notes on the piano which have a black note between them or between two frets on the guitar. This can be seen in the scale of C major which is the only scale on the piano which uses all white keys. That’s all very well but suppose you can’t sing in the key of C or you want to use a different scale for whatever reason? We can construct a scale starting on any note by just following the pattern of tones and semitones. But in order to preserve the pattern we need to alter some notes along the way. We do this by raising or lowering them. By making them sharp or flat. And there are symbols to tell us to do this. Notes can be made sharp or double sharp and flat or double flat when they are raised or lowered by a semitone or a tone respectively. So starting on the note of G major means we have to raise the F to F sharp (F#). In the scale of F major we have to lower the B to B flat (Bb). Here are the major scales. Now ever C becomes an E, every D an F# etc. The progression of scales is often represented in the circle of fifths where each new scale begins on the note of the fifth note of the preceding one, e.g. C to G to D to A etc. These sharps and flats are placed in the key signature at the beginning of a tune in a determined order on the stave to indicate the key. To identify the key from the key signature you can memorise the number of sharps or flats, or with time become familiar with them. However, if you’re starting out, then in a sharp key signature take the last sharp e.g. D# and step up one semitone to E and that’s the key. If it’s C#, step up one semitone to D and the key is D major. If you are dealing with flat key signatures then simply take the second last flat and that is your key, e.g. if there are 3 flats in the key signature, then the second last one is Eb and the key is Eb major. Minor scales come in three varieties. The natural minor has the structure Tone, Semitone, Tone, Tone, Semitone, Tone, Tone, e.g. A, B, C, D, E, F, G, A. The harmonic minor has the structure Tone, Semitone, Tone, Tone, Semitone, Tritone, Semitone, e.g. A, B, C, D, E, F, G#, A. A tritone is a distance of three semitones. The melodic minor has the structure Tone, Semitone, Tone, Tone, Tone, Tone, Semitone, e.g. A, B, C, D, E, F#, G#, A. This scale is different descending – the F# and G# become natural so it is effectively the natural minor scale descending. Minor scales are said to be related to majors. Basically to find the relative minor of a major scale just go to the sixth note of the major and that is the starting note of the minor. Each degree or note of the scale is given a name. Here we see it in the key of C major. After the tonic, the dominant is the next most important. 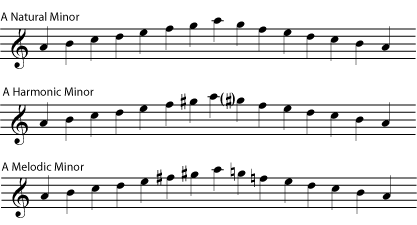 The leading note wants to pull to the upper tonic. In the natural minor scale the leading notes is called the subtonic as it is a tone rather than a semitone. The degrees of the scale can also be labelled using Roman numerals: I, II, III, IV, V, VI, and VII. Another type of scale is the chromatic scale. This includes all twelve divisions of the octave, i.e. all semitones or all black and white keys on the piano or frets on the guitar between a low C and a high C, for example. There are several scales which only use five notes and are hence named pentatonic. The major pentatonic scale has just five notes per octave. If we think of starting on C then the notes are C, D, E, G, A, C.
The minor pentatonic is essentially the same but it starts on a different note, e.g. A, C, D, E, G, A.